The colors and arrangement, all this creates a great, surreal-abstract composition. I love it ! ahhh, thats very fine. i love the minimalistic. 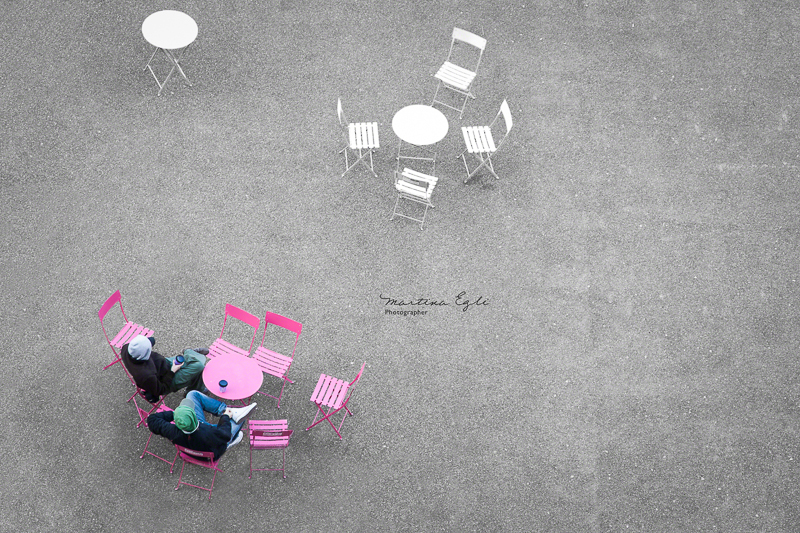 the grey underground, the white table in two versions and the pink table with the friendly people. Love this composition! The fact that it is the occupied table which is coloured is a great touch. This must really be a happy place with fresh colors on one table. Love the contrast in that wonderful composition. Un contraste et un cadrage magnifiques! Incredible; such a happy go-lucky moment! That splash of color is just nice in this image, it really makes the eye wander! pink is the color comes spring HA 🙂 you turn simplicity into totally fabulous. charming space exploration piece of work, sweet vision. Nice composition. It’s a colorkey, isn’t it?